St Andrew’s Church in Holborn received criticism after it offered up its building as part of London fashion week on Monday evening. The Anglican church’s alter was transformed into a runway for models wearing inverted crosses, devil horns and vampire costumes to walk down in Turkish designer Dilara Findikoglu’s Spring/Summer 2018 collection. Dr Adrian Hilton from the Archbishop Cramner blog told Premier the church’s decision to host the event was “bizarre”. Hey, here’s an idea- don’t book outside events that have nothing to do with Christianity. Let the secular venues handle that garbage. Double, double toil and trouble,. Fire burn, and cauldron bubble! Most of Donald Trump’s opponents believe they will have to wait four more years to see him leave the White House. But America’s witches are more optimistic. That’s the spirit! The can-do attitude that built America, and made it great! At the stroke of midnight on Friday, followers of witchcraft across the US performed a mass spell designed to remove the president from office. A Facebook group devoted to the ritual has attracted over 10,500 likes, and coined the hashtag #magicresistance. The development has sparked fury among Christian conservatives, who have accused the witches of “declaring spiritual war”. Idiots. 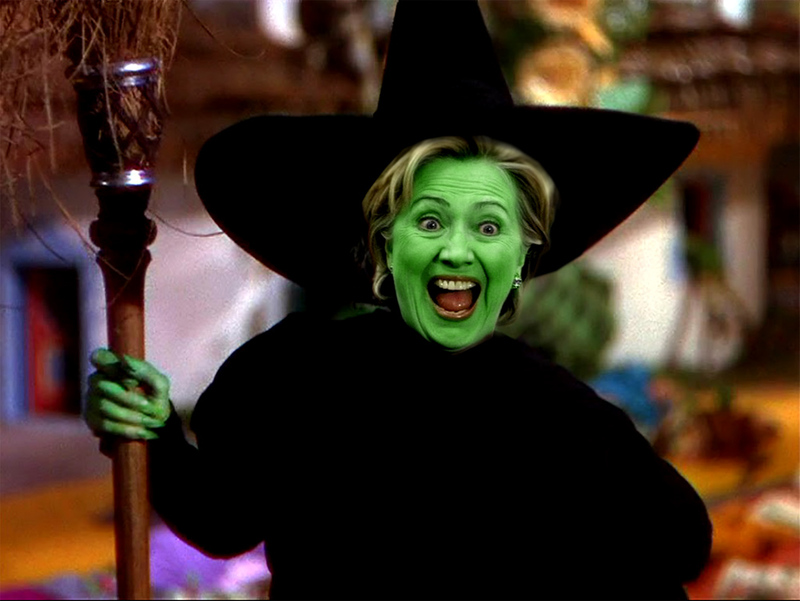 Witches have always been at spiritual war with our Lord; now they’ve merely extended their war into the temporal realm, against a head of state; in theory, at least: doesn’t look like their spell worked. But if at first you don’t succeed, try, and try again, prog witches! Writer Michael Hughes, who describes himself as a “magical thinker” posted a version of the spell online, saying he had seen multiple versions on private witchcraft groups. In it, he suggests using a stubby orange candle, an unflattering picture of Mr Trump, and a Tower tarot card. Followers of magic are told to carve the president’s name into the candle using a pin, recite an incantation, and then burn his picture in the flame. The words of the spell include a plea to the Wiccan deities to “bind Donald J Trump, so that his malignant works may fail utterly” and so that he “shall not break our polity, usurp our liberty, or fill our minds with hate, confusion, fear, or despair”. Mr Trump’s supporters don’t escape either, as the spell asks that their “malicious tongues” be curbed too. The writer said he published details of the spell because he felt “it would be very welcome to a lot of people”. Under the tenets of witchcraft, a “binding spell” does not wish harm on its target, but aims to stop them from doing harm themselves. And yet they’re burning his picture in effigy. Doesn’t add up, does it? MaryPat Azevedo, who took part in the ritual in Arizona, said she saw the ritual as “a unity prayer”. And did the Donald grant you his permission? Or are you not a true witch? D’Oh! Ms Azevedo said she hopes to see “physical, emotional, and spiritual changes in Donald Trump and American politics”. Me too. I’d love to see in Trump physical changes (him becoming even healthier, so that he may have a long, healthy and productive presidency), emotional changes (becoming thicker-skinned), and spiritual changes (hey, I’d love to see him become a faithful, orthodox, mature Christian). And I’d love to see all different manner of various changes in American politics, in a reactionary direction, of course. Participating witches plan to repeat the spell on days when there is a waning crescent moon, until Mr Trump leaves the Oval Office. The next ritual is set for 26 March. I’m sure President Trump is quaking in his boots! Perhaps unsurprisingly, some of the president’s followers are less than thrilled. Joshua Feuerstein, an evangelical pastor who has previously condemned Starbucks for taking Christmas symbols off its seasonal red cups, issued an “urgent warning”, saying “millions of witches” were trying to curse the president. “Their bippity-boppity-boo isn’t more powerful than the name of Jesus!” he declared in an online video. Exactly, so relax, bro; the Lord has got this. Chill out! The Christian Nationalist Alliance, a conservative religious group, named 24 February a “day of prayer” to counter the magical fraternity. I’m sorry, under what authority do they declare the right to dictate to the rest of Christians to suddenly follow this festival / fast / whatever? They’re not a church governing body, but go nuts guys, if it makes you feel better. In a post online, it called the witches “occultists” who want to summon dark spirits against Mr Trump. The group said it will urge people to pray every time the spell-casters reach for their candles. People should always pray. They don’t need to think of this as some sort of contest where the side that prays the hardest will beat the other. Thus far, Mr Trump has failed to comment on the battle between Bible and broomstick. No, but he has disinvited you, BBC, to press briefings; that should give you an idea of what he thinks of your reporting and coverage overall, much less individual prog-straw-grasping-, silly ‘stories’ like this. And so, the precious concept of mercy becomes a byword for perpetuating clericalism and injustice, swaddling it in a slanket of sentimentality. I’ve noticed, at The American Conservative in the past, and again in a comment on this piece, some people comparing Pope Francis to Trump; seeing him as a maverick, coming in, breaking rules, changing things, etc. So, Benedict was the maverick, the radical reactionary who came in and tried to fix things, only to find himself blocked, and his efforts undone by his successor. The better comparison, IMO, for Pope Francis, is in fact to Obama; he is changing some things, in a negative direction, while trying to undo the good that Benedict wrought. Francis supporters want him to legitimize divorce and remarriage and silence his critics; if it also means tolerating pedophiles, well, what’s a few kids as long as Francis goes long with the Sexual Revolution in the Church. Just as, in politics, progs loved Obama for radically pushing their agenda, and didn’t care about any other considerations, like increased Islamic immigration and resultant terrorism, the alienation of poor and working-class heartland whites, increased black militancy and racial strife actually resulting rather than improved racial harmony, etc. Church ‘mission trips’ are just church-funded vacations-in-disguise for teenagers / young adults. We should do away with them. As Great Britain voted in favor of a motion to leave the European Union, premillenial dispensationalists around the world held emergency meetings Friday morning, frantically adjusting their prophetic charts to include the completely unanticipated new development. “We’re thinking of calling this one ‘The Brexit Dispensation,’” Tim LaHaye told reporters as he hastily altered his precise wall charts to account for the new information. “We had previously thought that Saddam Hussein would be the one to usher in the one-world government, but that’s looking less likely now, so we’re going to make some official adjustments.” LaHaye added that the European Union might not be ushering in an age of one-world government after all, unfortunately.